NHL Central Scouting says: Solid and effective butterfly; technically a very sound goalie – excellent positional play – great instincts and very smart at reading the plays – good timing and quick reactions to always be in the proper position – well balanced stance and square to the shots – plays mostly at the top of the paint on initial shots – quick and controlled lateral movements – effective at absorbing shots into his body and directing low shots away from danger – efficient post-to-post play – good use of his gloves – good at eliminating holes in tight situations – very reliable and capable to handle playing majority of the games. NHL Central Scouting says: Brings pro size with very good quickness and athleticism – has the ability to steal games for his team – excellent compete and work habits – very smart tracking pucks through traffic and at reading the cross ice one-time plays – powerful leg drive with quickness; moves laterally with quickness and control – excellent positional play (top of the crease and square with a solid, well balanced stance) – plays big in all situations – good quickness and timing when dropping in the butterfly; quick to react and recover – very good glove hand – very good overall rebound control and placement. NHL Central Scouting says: Smart and poised, puck-moving defenseman with good offensive instincts – supports the rush and makes himself an option on the attack – smart puck game finding open options on zone exits – strong skater who uses his mobility to be in good position – capable to skate the puck out of trouble and has a good stick defending – good puck distribution on the power play and ability to find the shooting lanes – effective in role with and without the puck – played for Team Russia at the Hlinka Gretzky Cup. NHL Central Scouting says: First year in North America and seamlessly transitioned his game – solid two-way defenseman with an encouraging offensive upside – very smart player with efficient puck skills; poised and patient with the puck to make the plays – sorts out options very well – strong on his skates and a very efficient skater with excellent mobility – capable to log heavy minutes and plays in all situations – defends well using his stick and body position – one of the best in this draft class at understanding his position. NHL Central Scouting says: Solid two-way defenseman that brings a good puck game and a physical element – good size and strength to play with a presence – strong skater with good mobility and agility playing his position – plays big minutes on Kelowna in all situations – second on his team in scoring for defensemen – played for Team Canada at the Hlinka Gretzky tournament. 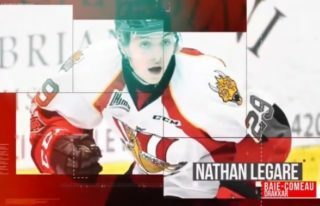 NHL Central Scouting says: Big body defenseman that can play in all situations – strong shutdown defenseman and penalty killer – uses his size and reach well to take away time and space – leads his team in points by a defenseman – plays a physical style and will stand up for his teammates. NHL Central Scouting says: Good-sized two-way defender with offensive potential – very good skater showing good north/south speed along with east/west mobility – defends with a purpose; plays with poise and confidence – very good gap control, reading and reacting in all three zones taking away opposition time and space – uses his body as needed and is hard to play against; can punish opposing forwards when called for – heads-up game with the puck, accurate passes and transitions quickly from defense to offense. NHL Central Scouting says: Highly skilled offensive defenseman with game-breaking ability – looks to lead and join the rush; transitions quickly on plays – excellent passing game with very good vision and touch – leading scorer for rookie defensemen in the WHL; leads Kelowna in scoring for defensemen – responsible defending utilizing effective positioning to take away time and space – good stick-to-puck technique. NHL Central Scouting says: Skilled playmaking centre – good skater that uses good vision to find open man – drives the net and can finish in tight – strong two-way game; used in all situations for his team – poised puck decisions and has the patience to make the right play – creates time and space with puck skills and has the creativity to make plays. NHL Central Scouting says: Good-sized two-way power forward with deceptive offensive abilities and instincts – possesses very good puck skills and can be very clever in one-on-one situations – good vision with the puck and executes skilled plays in traffic – good hockey IQ with the ability to anticipate the play; can be an important figure to his team’s offensive attack. NHL Central Scouting says: Hardworking right winger who makes deceptive plays and controls the puck like a centreman – tenacious checker; doesn’t let up in puck battles – ultra quick changing gears to separate self from checks and pull away speed with the puck – very good puck control/movement game to go along with offensive hockey sense – unselfish and patient game with the puck – has the hands/moves/shot to contribute offensively – played for Team Canada at the Hlinka Gretzky tournament. NHL Central Scouting says: Deceptive skating with top end speed when in motion – excellent vision and skill – solid playmaker who has a quick release scorer’s shot to finish chances – strong one-on-one player; good puck protection game and hard to defend against in all situations – a legitimate scoring threat when the puck is on his stick – capable to control pace and outcomes of games – high-end pick for the 2019 NHL Draft – played for Team Canada at the Hlinka Gretzky tournament. NHL Central Scouting says: Offensively skilled player who plays a responsible game – very good hands and creative game especially when given time and space – good vision, quick instincts, skilled game handling and moving the puck in traffic – good at finding the open man and delivering the puck for a quality chance – quick shot and release as well as one-time ability – he skates well and when playing with energy can be a very effective and dangerous offensive threat. NHL Central Scouting says: Power scoring winger leading the charge on the team with the best record in the CHL – having a breakout season as a 19-year-old displaying very good skill, vision, and hockey sense – size/strength asset allows for excellent puck protection game down low and to the net; hard to check the puck off him – strong offensive instincts and soft hands make him a legitimate scoring threat whenever he’s on the ice – plays primary role on both the powerplay and penalty-killing units – finds the openings and has a quick release shot – played for Team Canada at the 2019 World Junior Championship. NHL Central Scouting says: Very good offensive player with great hockey sense – skilled forward with good vision, instincts, and puck skills – smart and patient with the puck yet quick to be able to take advantage of opportunity – smart offensive zone entries allows him to create quality chances for his teammates – very good skater with speed and quickness when needed – competes with energy style game in and game out – valuable offensive player for his team. NHL Central Scouting says: Solid two-way forward who plays with energy and tenacity – type of player that can play up and down the lineup – gritty winger with a strong puck pursuit and forecheck game; good battle game down low – very effective penalty killer – played for Team Canada at the Hlinka Gretzky tournament. NHL Central Scouting says: Skilled winger with high hockey IQ – very good quickness with the puck and exceptional ability to change speeds – high-end puck skills and vision to create plays in offensive zone – responsible to play a complete two-way game and plays with energy – protects the puck and drives the net like a power forward – poised to find the openings and makes good decisions under pressure – offensive catalyst and scoring threat every shift. 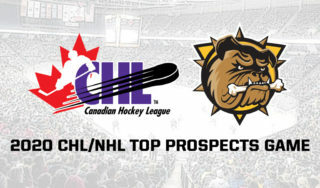 NHL Central Scouting says: One of the best playmaking prospects for the 2019 draft class – very good offensive hockey sense – dynamic puck composure game and effective at making plays at top speed – exceptional 360-degree vision game; makes the players around him better – quick hands that can mesmerize defenders – heads-up game to make the smart play in all zones – played for Team Canada at the Hlinka Gretzky tournament. NHL Central Scouting says: Skilled forward with very good hockey sense and puck skills – excellent vision on offensive zone entries and strong playmaking ability – smart offensive instincts to recognize opportunity and quick to generate or capitalize on scoring chances – deceptive speed and quickness – competes to the net and goes to the dirty areas – responsible game with and without the puck. NHL Central Scouting says: Good package of skill and offensive hockey sense – good hands and quickness in tight quarters – elusive speed and quickness make him tough to contain – positions himself well on the powerplay; willing to go to dirty areas for scoring chances – versatile to play either wing position effectively – competes and battles on pucks – quick release and good finishing touch – played for Team Canada at the Hlinka Gretzky tournament.